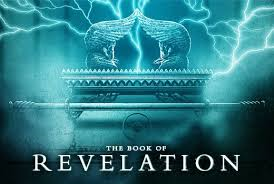 The Book of Revelation, is a book chock full of visions and imagery, some incredibly beautiful and others incredibly horrific and disturbing. It all starts with John stranded on an Island all by himself. 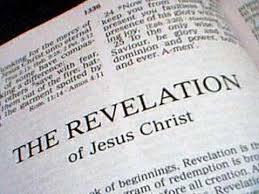 The Book of Revelation really begins with John (the Revelator as he would soon be known as) on the Isle of Patmos, a small Greek Island in the Aegan Sea taken up to Heaven on the Lord’s Day. This begins the Revelation of Jesus Christ. We know that the Lord God wants John to know that he has 7 messages to be sent to the 7 churches of Revelation. leading to Seven Plagues or Vials of Wrath. emphasis in the Old Testament seemed to start with the 7 days of creation, with 6 days of actual creation and one of rest (the Seventh or Sabbath day when God rested known as Shabbat in Hebrew). ,and they also which pierced him and all kindreds of the earth shall wail because of him. Even so, Amen. Clearly a reference to Yeshua’s coming back and that the Jews will even realize that they put their Messiah to death. The verse is a Messianic prophecy from Zechariah in 12:10, when Zechariah is talking about God pouring his Grace and Supplications upon all flesh and that they shall look upon whom they have pierced, and they shall mourn for him, as one mourneth for his only son, and shall be in his bitterness for him as one that is in bitterness for his first born. John hears the voice of the Lord which is described as a great voice, like a trumpet in Revelation 1:10. Twice in Ch.1 the Lord identifies himself as Alpha and Omega, the beginning and the end, the first and the last. The Seven Churches are found in Asia Minor and include Ephesus, Smyrna, Pergamos, Thyatira, Sardis, Philadelphia and Laodicea. So God speaks expressively about these seven churches and these churches also represented a very specific time period in what is known as church history or the church age. The Church of Ephesus represented the apostolic period of the church from approximately A.D 30-100. Smyrna or modern day Izmir located in Turkey represents the age of martyrs of the church in the second and third centuries. Still another Church, was the Church of Smyrna known for the persecution it experienced and it’s fearlessness. Pergamus or Pergamos in Greece represents the age of the State Church (which gave away to the creation of the Catholic Church). Thyatira represents the Church time period in Church history when the Church is both fully established as a Church and as a State. The Sardis church represents the church era during the time of Reformation. The Philadelphia Church represents the age of the Missionary Church. The Lord finds fault with most of the Churches. With Ephesus, the Lord wants to see true repentance and for them to return to their first love (God). With the Church of Smyrna –God recognizes that some of the church are actually of the Synagogue of Satan although they claim to be Jews, they really aren’t. This is a major carry over even today when you look at the Zionist Movement following the money trail of the bloodlines and the families that we know as the global elitists. All of these families claim a bloodline with some form of Jewish ancestry including the Royal Family and all the New World Order elitists. Also currently the fascination of celebrities and the well to do with Cabalism and the occult (which is really just a part of the Mystery Babylon religion) has seen an incredible revival. 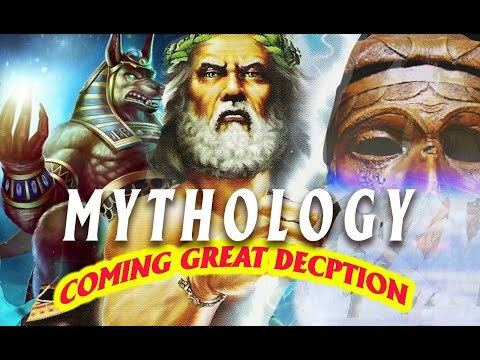 Is it any wonder with talk that King Nimrod, who was considered as the Sun God will be returning again (if indeed his DNA has been captured as rumored and he can be cloned) since Nimrod is at the forefront of the Mystery Babylon religion. 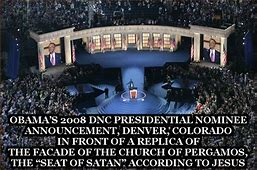 All of this is wrapped up in an Illuminati wrapper of sorts and we indeed have the ingredients for at the very least, the congregation of the Synagogue of Satan. We soon shall see, won’t we. 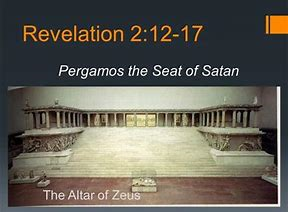 With Pergamos, God reveals to us that Satan’s seat has already been built. It was an immense alter to Zeus (another name for Molech, Baal and Satan). In fact it is that doctrine of Balaam, which is a campaign of seduction and treachery to lure the Israelites from their one true God (just like Balaam attempted to do back in the Book of Numbers 31:8). Balaam wanted to use Moabite and Midinite women to tempt the Israelites into sexual relationships and ultimately into pagan rituals. See the MOB we did on this very topic for more information. God considered this a major stumbling block for the children of Israel. 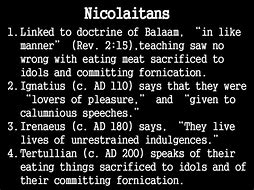 Then there was the doctrine of the Nicolaitans, which God equally detests. The Nicolaitans were the spiritual descendants of Nicolas of Antioch. Nicolas had deep roots in paganism as well as occultism, so the doctrine of the Nicolaitans is one of compromise, something God has no use for as we are to love the Lord God with all our heart, all our might and all our strength, this is of course is the first commandment of God and the most important one of all. Of the church of Thyatira, God is upset that the demonic Jezebel was allowed to commit spiritual fornication with the flock, even allowing things to be eaten that were sacrificed to idols. God wants the church to flee idolatry and the works of Satan, or deal with God’s Wrath full on. With the Church of Sardis God commands them to repent and watch for him, or he will come to them as a thief in the night. We have studied this as a MOB previously as well. This also is a message for the last days Church as well, if not a stern warning -that God will find some asleep (spiritually no right with God) when he comes and to them he will be as a thief in the night. With the Church of Philadelphia, God warns of the Synagogue of Satan coming in and corrupting all the great works the church has been doing. God warns them not to stumble at the influence of Satan. God will use the church as a shiny example to convict Satan’s synagogue of what it is like to follow the Lord. Ch.3 V.9 reads, Behold I will say make them of the Synagogue of Satan, which say they are Jews, and are not, but do lie; behold, I will make them to come and worship before thy feet, and to know that I have loved thee. So let’s recap here what the Lord basically told the 7 Churches where they stood with him. 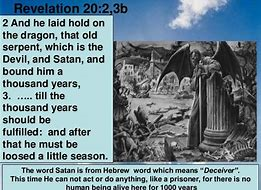 The Church of today , The End times Church comprises of both the Church of Philadelphia (who are the true church and remnant /children of God) and a larger contingency of the Church of Laodicea (who are the backslidden / lukewarm and apostate Christians). God says he knows their works and because they are lukewarm and not hot or cold he will spew them out of his mouth. God has no use of those who say they have no need of God because they are satisfied that they are “good enough” but they are really and truly wretched and miserable. Even the Lord said no one is good, no one save the Lord of course. God stands at the door of everyone’s heart and knocks at this very hour and moment, even this second as you are reading this. If any man hears God’s Voice and opens the door, God will come into their hearts and lives and will sup with them forever. This is the Revelation of the Lord Jesus Christ to the Church in Laodicea to the Church of the last days, here and now. 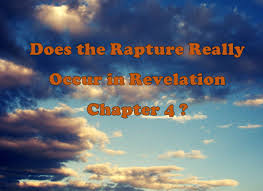 After Chapter 5 the church will not be mentioned in the Book of Revelation again until the time when Christ returns with his bride, the Church to put a halt to man’s destructive and evil schemes. We pick up where we left off in The Book of Revelation Ch.4 as we have been looking at The Revelation of Jesus Christ as speaking to the angels of the Seven Churches. We go through the next 3 chapters of the Book of Revelation in this segment. 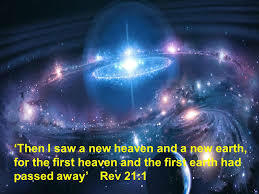 John the Revelator looks up and sees a door opened to Heaven, which is a hidden dimension to us here on the Earth. It’s a type of invisible (to the naked eye) door /portal above the firmament which perhaps is an entry point to another plane of existence, almost a parallel plane. The Voice of God sounds again like a trumpet telling John to come up to the Heavenly abode, so that he can bear witness what must come to pass in the future. 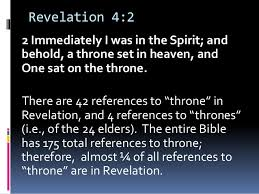 Some mistake this as undeniable proof for the pre-trib Rapture of the Church, but there is no evidence for this other then the Church is no longer mentioned in the Book of Revelation until Christ returns with his Church to the Earth at his second coming. John takes note he is not in the flesh, for no flesh can dwell or see Heaven. John sees a throne with an individual sitting on the throne. 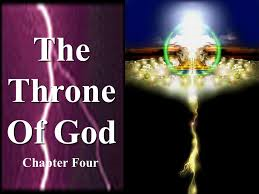 There was a rainbow surrounding the throne and it sparkled like an emerald. 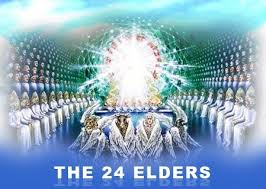 There were 24 elders sitting in seats around the throne all dressed in white with crowns of gold on their heads. The voice on the throne had a voice like thunder and lightning and there was seven lamps burning which represented the seven spirits of God. Just who are these seven spirits of God (who are represented as seven lampstands) anyways? Isaiah 11:2 holds the clue and reads, The Spirit of the Lord will rest on him –the Spirit of Wisdom and understanding, the Spirit of Counsel and of Power, the Spirit of knowledge and the Fear of the Lord. We have Seven Spirits of God here including the Spirit of the Lord, the Spirit of Wisdom, the Spirit of Understanding, the Spirit of Counsel, the Spirit of Power, the Spirit of Knowledge and the Spirit of the Fear of the Lord. Another interpretation is that the 7 Spirits really represent the Holy Spirit and the perfection of God through the number 7 (which of course is the number of perfection) and really represents the perfection of God’s Holy Spirit. 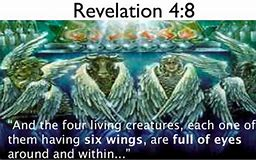 The 4 beasts had six wings with eyes covering their wings. These beasts praise God all the time and the 24 elders also joined into worship of the one who sat on the throne, the Almighty Father God. 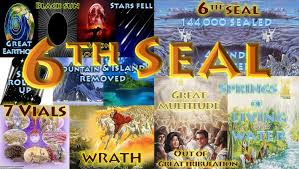 In the right hand of God who sits on the throne is a book sealed with seven seals. An angel of distinction came forward and asked who is worthy to open this book and loose the seals found with in it? There was no man in Heaven and Earth who could open the book or even look inside this book. John started to weep because no one was worthy to open the book. 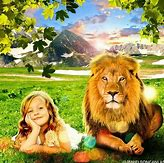 One of the elders told the others to stop weeping because the Lion of Judah, the Root of David, Yeshua Ha’ Mashiach has overcome the World, death and hell and he alone is worthy and can an open the book. In the midst of the elders stood one that was like a lamb that was slain and had seven horns and seven eyes which represents the Seven Spirits of God sent forth into all of the Earth. The Lord Jesus came and took the book out of the right hand of his Father who sat upon his throne. The 24 elders begun to worship the Lord and they sung a new song about the Lord being the only one worthy to open up the book. Then a white horse with a man with a crown like a King appeared. This man is the fake messiah, this is the appearance of the Antichrist on the Earth who is a war monger, destroying all in his path (a common characteristic of all antichrist types as we have discovered). 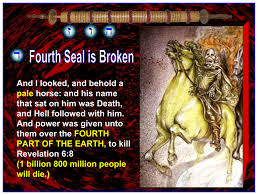 The Second Seal, the second beast also said, “Come and See”, still another horse that was red and the one riding was still another warrior of destruction who would entice those on the Earth to kill one another. 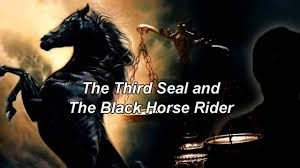 Then the third seal is opened with the third beast announcing to “Come and see” a black horse and the rider had a pair of balances in his hand. An unidentified voice then announced a type of weights and measures, what is most likely the cost of food becoming so outrageously expensive that even the wheat and the barley will become too costly for anyone to afford and so many will starve to death. The oil and the wine is apparently left alone to serve as a type of greater purpose in the greater scheme of things. The fourth beast then announces that the fourth seal is going to be opened. This was the pale horse and the rider on it was none other than Death and Hell. These of course are the 4 Riders of the Apocalypse and between the four of them we have what will end up wiping out ¼ of the entire World’s population. The depopulation of the earth will be comprised of those killing one another, mass death from famine and from pestilence and all sorts of causes of death natural and unnatural. We covered this in a past MOB from the Book of Zechariah Ch.6. 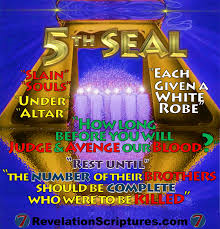 The fifth seal was opened, John the Revelator then saw all the souls of those saints persecuted and killed during the Great Tribulation because they stayed faithful to the Word of God. These souls all cried out in unison to the Lord asking when their blood would be avenged and when the Lord would judge those who had persecuted and killed them. 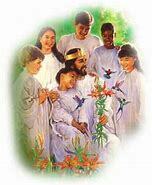 These saints all were given white robes and told to rest a while because more would be joining them soon. 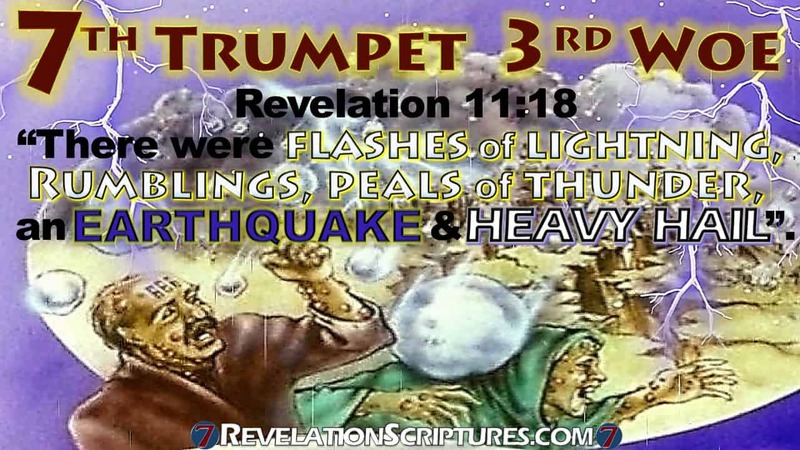 Scripture indicates that many more saints would be killed during the Hour of the Great Tribulation. The Word of God says that like their brethren killed before them, they shall be killed. 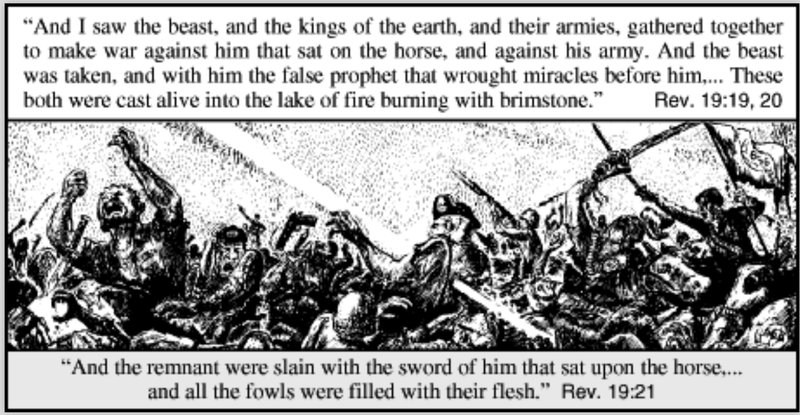 We know the guillotine will be brought back, because we know we will see in the Book of Revelation, a huge congregation of those saints who were beheaded for their faith. Some have speculated that this could be a mind control preparation or a type of psy-op program involving ISIS and all the beheadings in the last few years that have been put on video and have gone viral. Scripture says it is going to happen, so we know it’s real, many followers of Christ will be beheaded in the Great Tribulation! The sixth seal is opened and a great earthquake shakes the Earth’s foundation and the Sun turns black. The Moon is blood red in appearance. 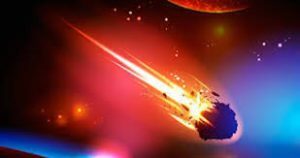 All these events parallel that of the prophecy of the Day of the Lord (please see our many MOBS on this subject).The stars then began to fall from the Heavenlies unto the Earth. Some of the pieces of constellations or stars will eventually fall from the sky and into the water, poisoning it and making it deadly under the name wormwood. 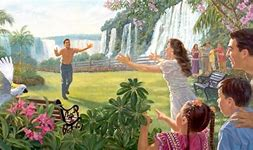 Heaven is described as being a scroll that has rescinded and perhaps this is where there is a continental shift alignment for the Word of God, says every mountain and island were moved out of their places. Only a continental pole shift could move the Earth plates to cause this to happen. never mind dreaded Tsunami’s of epic proportions. Then in an interesting development a prophecy that is already been proven true, the rich and the elite classes who all have special hiding places underground to escape the disaster taking place on the surface, all will try to hide themselves in the rocks of the mountains in their fancy underground lairs. It won’t help of course, as God can go anywhere and everywhere and there is no place to run from God and his wrath. They will have no peace however down underground in fact they will wish to die for they finally experience and know the Wrath of God is upon them and the inhabitants of the Earth and yet there is nowhere to run or hide on the entire Planet. They hope for a quick and sudden death. However the Wrath of the Lamb will go exactly according to the Lord’s Plans and not ours or anyone else’s. 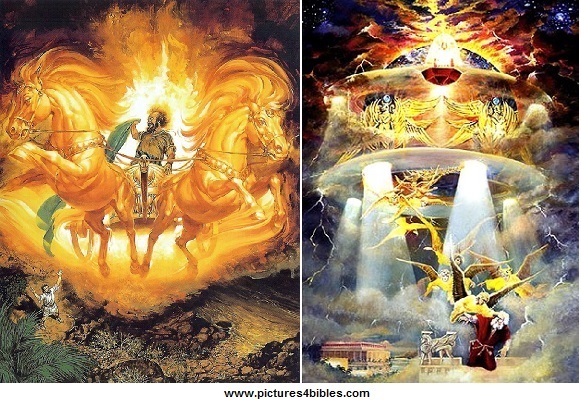 Ch.6 of the Book of Revelation, For the great day of his wrath is come and who shall be able to stand? Will you beloved, be able to stand? 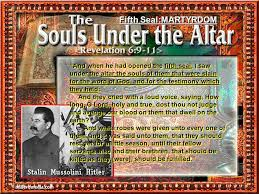 Only those found in Christ, Yeshua Ha’ Mashiach, will stand on that “day”. As we continue our look at the amazing Book of Revelation, beginning in ch.7. 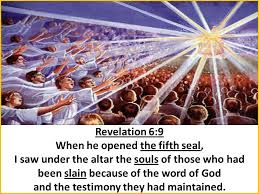 John the Revelator continues to witness the Lamb of God opening the seals. 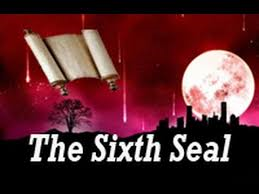 In this case it’s the sixth and seventh seals that are opened. John sees four angels standing on the four corners of the Earth and they somehow are holding the four winds of the Earth at bay. The winds over the Earth, the sea and the trees come to a complete stand still. Then an angel comes from the east and this angel has the Seal of the Living God and cries with a loud voice to the four angels who would rule down God’s Judgment upon the Earth and the sea. 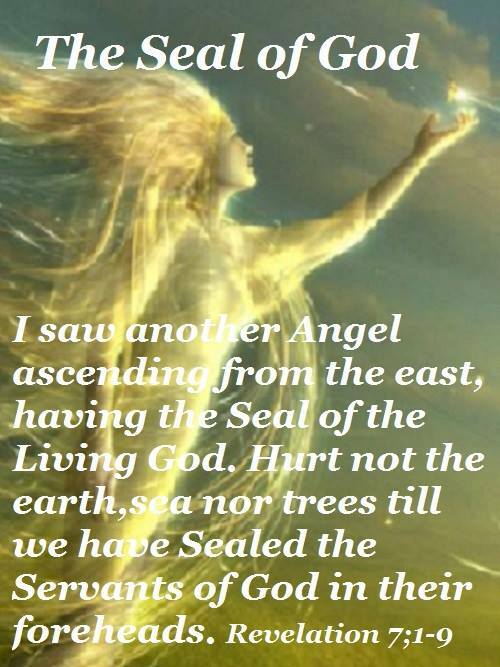 The angel tells them not to hurt the Earth or the sea or the trees until God has sealed all his children (the saints of God) in their foreheads –with God’s Mark. Remember we had a MOB about the Mark of the Beast being the counterfeit mark for the Antichrist and how God has his own mark of protection for his children? Satan (unlike God the Creator of all life) cannot create anything beloved, he only can copy and he is always doing a satanic counterfeit of what God has already done. It was at this time that John heard the number of those that were sealed by God. It was 144,000 of all the tribes of the children of Israel. The 144,000 servants of God are sealed and are the representatives of the twelve tribes of Israel. 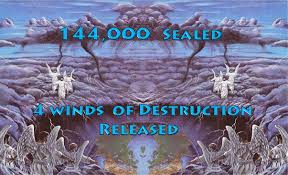 12,000 were chosen from each tribe and they will be protected from the wrath of Satan and the Antichrist during the time of Jacob’s Trouble, The Great Tribulation. There will indeed be a great multitude saved out of the Great Tribulation and it is these who will have washed their robes made white by the Blood of the Lamb. One of the reasons we need to have a sense of urgency when it comes to sharing the gospel is because of the passage found in 2 Thessalonians 2:10 -12 which reads, And with all deceivableness of unrighteousness in them that perish: because they received not the love of the truth that they might be saved. And for this cause God shall send them strong delusion, that they should believe a lie: that they all might be damned who believed not the truth, but had pleasure in unrighteousness. There are many who already are under the influence of the strong delusion and they have turned their back on Christianity. 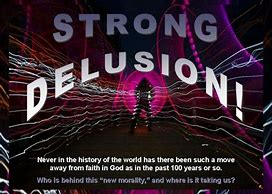 That is a long passage, but a very revealing passage that clearly indicates all those that were presented the gospel before the Tribulation and reject it, will be sent a strong delusion (another MOB we have covered), so that they will believe the lie. So it’s so important to make sure all our loved ones that are lost are hearing the gospel and coming to the Lord, now while there is still time. The window of time is getting narrower and narrower on a daily basis. The only ones who can truly be saved during the Great Tribulation are those who have never heard the gospel previously. 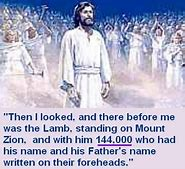 So here was this multitude of a congregation, so great in number standing before the Throne of God and Yeshua, the Lamb of God. 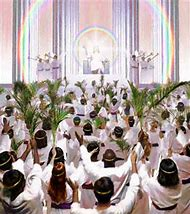 They were all clothed in their white robes with palms in their hands worshipping the Lord of Lords and King of Kings. 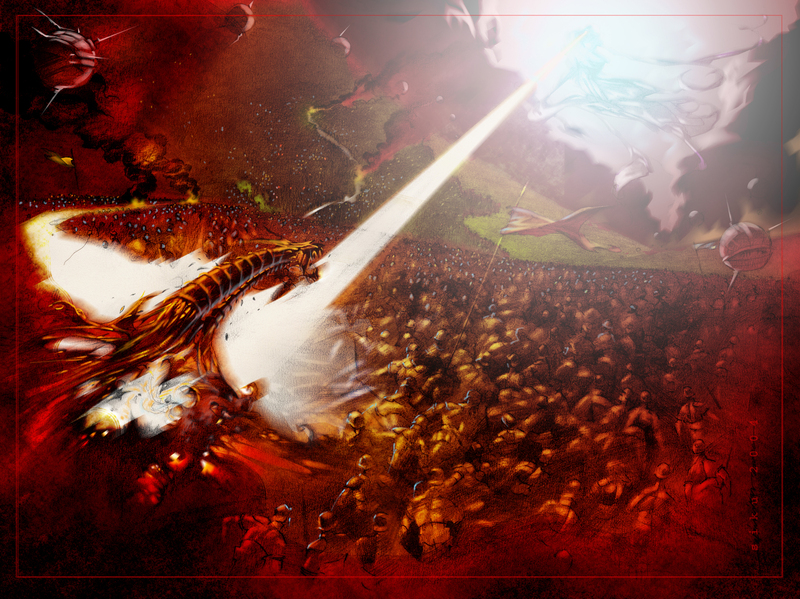 So the multitude, all the angels, the elders and the 4 beasts all fell before the throne on their faces worshipping God. 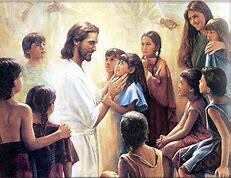 One of the elders then asked John who all these in the multitude with white robes were. John told him that they came through the Great Tribulation and washed their robes in the Blood of the Lamb (the Lord’s sacrifice at Calvary’s Cross). 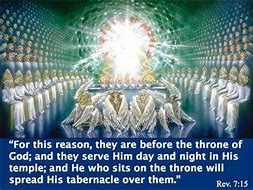 For this reason, this multitude worships the Lord day in and day out, before his throne in the Lord’s Temple and have all their needs taken care of. They no longer hunger nor thirst no more nor will they have any tears or suffering anymore. They won’t get tired and never need to sleep, the concept of time is done away with, for now all is eternal. Making the decision however is very much a subject to time, time that it is running out quickly! Then there was silence in Heaven as the Seventh Seal was opened. It is at this time that the Seven Angels with Seven Trumpets began to sound one by one, which we will review shortly. and unleash the hideous demonic entities trapped inside the pit. These demons and monsters will be unleashed upon the Earth! The Planet is in complete and utter Chaos and the World seems to at it’s end. Picking up where we left off in Ch.10 of our journey through the Book of Revelation, John’s vision continues. John sees a mighty angel, a strong angel that comes down from Heaven. This angel was partially hidden in a cloud with a type of rainbow like image over his head and his face shined bright like the Sun and it’s feet were like 2 pillars of fire. 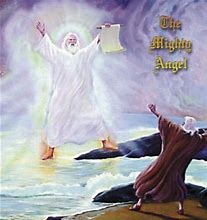 There was a little book that was opened up in the angel’s hand and the right foot was placed upon the sea, the left foot was placed upon the Earth. This mighty angel let out a loud cry that was like a lion roaring with seven thunderous voices that spoke and uttered things that no one must know and a voice from Heaven commanded that the seven thunderous voices be sealed up. 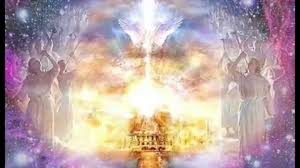 The mighty angel lifted up his hand to the Heavenlies and to God the Father and swore a solemn oath by God that all the things God has created up to this point and time had come to an end of themselves. 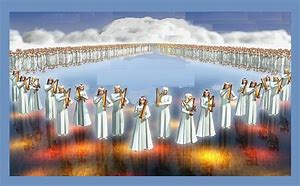 All of this was taking place between the 6th and 7th trumpets and the seventh angel was getting ready to sound his trumpet and with it, the Mysteries of God would draw to a close as God as was promised such would happen to the Prophets of God. Colossians 1:26 reads, Even the mystery which hath been hid from ages and from generations, but now is made manifest to his saints. The voice from Heaven told John to take the little book and eat it. The voice told him it shall be bitter in his belly, but the taste will be sweet as honey. John did eat it and it was like the voice promised, bitter for his belly but sweet in his mouth. The angel then tells John that he must continue to prophesize before many people, nations, tongues, kings and common folk. The strong angel then asked John to measure the Temple of God as well as the alter. The angel tells John not to measure the court that has no temple as that has been given to the Gentiles. For the Holy City of Jerusalem will be tread under foot for 42 months (roughly 6 years). It’s at this precise time that the angel of the Lord introduces the Two Prophets or Two Witnesses of God. 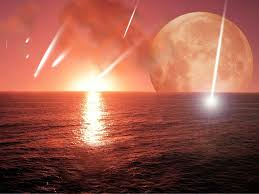 God is going to give his two witnesses the power to prophecy for a duration of time (1,260 days which is the time of the Great Tribulation). The 2 Prophets of God are dressed in sackcloth and scripture compares them to 2 olive trees, like 2 candlesticks standing before God the Father, Yahweh. if someone hurts or kills them, the same thing will happen to them. The 2 Witnesses will have powers from God to shut down Heaven, stop the rain and turn the waters into blood and to smite the Earth with plagues if needed. 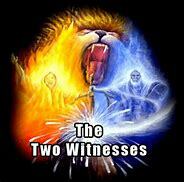 Either way, Elijah as we will discuss in a moment is a good candidate to be one of the 2 Witnesses. 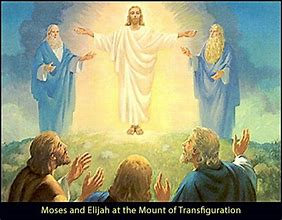 Moses was selected because of the fact he appeared at the transfiguration of Jesus alongside Elijah. 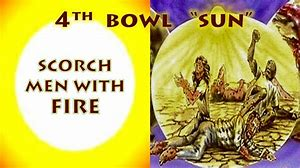 and Elijah as we all know was taken up into Heaven in a fiery chariot (that some to this day declare was a type of inter-dimensional craft that might very well resemble a flying disc of sorts or a UFO as it is more commonly known as). the Two Prophets of God and will eventually kill them. 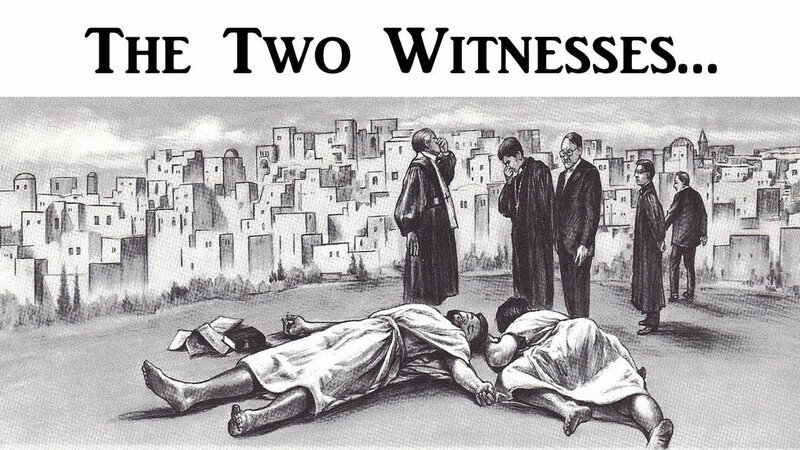 The dead bodies of these Two Prophets will lie in the Streets of Jerusalem. Many people everywhere will see these 2 dead men lying there for 3 ½ half days (most likely on television). Many on the Earth will rejoice and celebrate that they are dead because the 2 Prophets had “tormented them” by confronting them about the need for them to repent of their sinful and wicked ways. 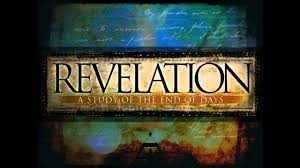 We are continuing our Study of the Book of Revelation as seen through the eyes of John the Revelator as provided by God Almighty. We are in Chapter 14 now. 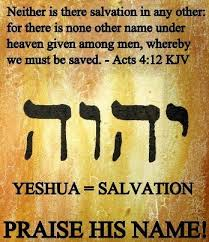 Yeshua is standing on Mount Zion with the 144,000 Jewish Virgins (brought to the Lord by the Two Witnesses) and who are sealed with the Mark of God on their foreheads. 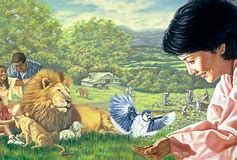 John could hear a voice from Heaven and the sound of harps and singing of a new song before the throne of God the Father and before the four beasts and the elders. Only the 144,000 young Jewish Men apparently knew this song. We are told these 144,000 are not defiled and have been redeemed by God and are God’s first fruits. 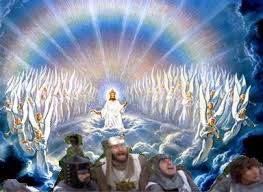 John then sees another angel flying in the midst of Heaven saying with a loud voice that God should be feared and given glory. Still another angel declares that Babylon the great city has fallen. This city has made all other nations drink of her fornication. There is great conjecture of which city this is. Many think that the city they are referring to is New York City –the Big Apple (or the partially bitten apple as in the apple that Adam and Eve ate and also the icon for the very well known Technology Company of the same name). New York City is the icon city where you have in the lyrics New York, New York the truth that it is the most self-serving city on the face of the Earth. It’s the city that never sleeps where you can be king of the hill and top of the heap. If you can make it there you can make it anywhere. In that place New York you will pursue being number one, top of the list, king of the hill, A-number 1. In other words in this City you will put yourself first even over God. It’s a city that is built for idolatry and it makes sense that it is this City that hosts the Statue of liberty (which is really a giant idol statue of a pagan sun god Helios and is really of freemason and ultimately Illuminati origin). The statue represents the light bearer of the illuminati and their leader, Lucifer none other then Satan himself. It has nothing to do with liberty. Some think that Babylon is actually none other then the real Babylon in Iraq. However after Sadam Hussien was removed from power not all that much has happened in the land of the original Babylon. Sadam was trying to rebuild the ancient City of Babylon but never got close to getting it going. and took something believed to contain DNA from Nirmrod. Why this was done if it indeed in fact happened in the first place is another topic for another day. The point is aside from this, nothing else has been happening that we know about in Iraq at this time. That is not to say that won’t change. There are others who think the richest city on Earth, Dubai might fit the bill as Babylon. Then there are still many with the traditional perspective that the Whore of Babylon riding the beast is none other than Rome. tip off some readers that this is the revived Roman Empire and the beast here is none else then the Vatican Church of Rome. 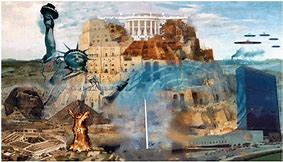 Regardless of which city fits the bill for Babylon, one thing is certain, it is destroyed by God’s Wrath for it’s sins of spiritual fornication (the worship of pagan and idolatrous Gods). The third angel followed the other angels, making a proclamation that if any man worship the beast (the Antichrist) and the Antichrist’s image and receives the mark in his forehead or his hand, they will suffer the Wrath of God. We did a MOB on the cup of wrath that God will pour out upon all sinful and unrepentive flesh on the Earth. The results of God’s Wrath will end up being fire and brimstone for the unrepentant. They will be punished for all of eternity for taking the Mark of the Beast and worshipping the beast and his image. 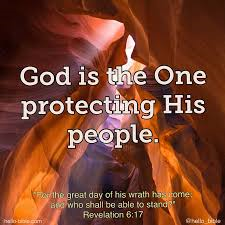 The Tribulation Saints on the other hand who keep the commandments of God will be blessed of God. 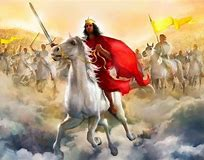 John the Revelator then sees a white cloud and he sees the son of man, the Lord Jesus Christ, Yeshua with a golden crown on his head and a sharp sickle in his hand. An angel came out of the Temple of God in Heaven crying out to the Lord of Lords and King of Kings, pleading with the Lord to use the sharp sickle in order to reap and harvest the Earth. The Lord did thrust his sickle and the Earth was reaped. Still another angel came out of the temple in Heaven, with a sharp sickle. While another angel came out from the alter and this angel had a power over fire. This angel cried out loud for the angel with the sickle to thrust the sharp sickle and gather all the clusters of the vines of the Earth. The angel used his sickle and thrust it into the Earth and then gathered all the vines of the Earth casting them into a winepress containing the Wrath of God. Blood came out of the winepress, so much so that it fills the Earth up to the bridles of horses that is close to 5 feet deep of blood covering the Earth. 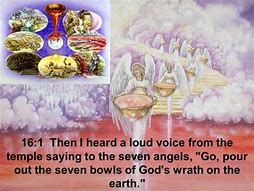 John then sees another sign in Heaven, as seven angels who have the seven last plagues containing the remainder of God’s Wrath upon the Earth. 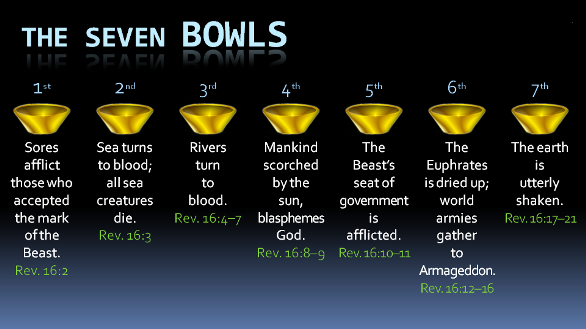 The seven vials or seven bowls (as they are more commonly referred to) represent the Wrath of God during the Great Tribulation. 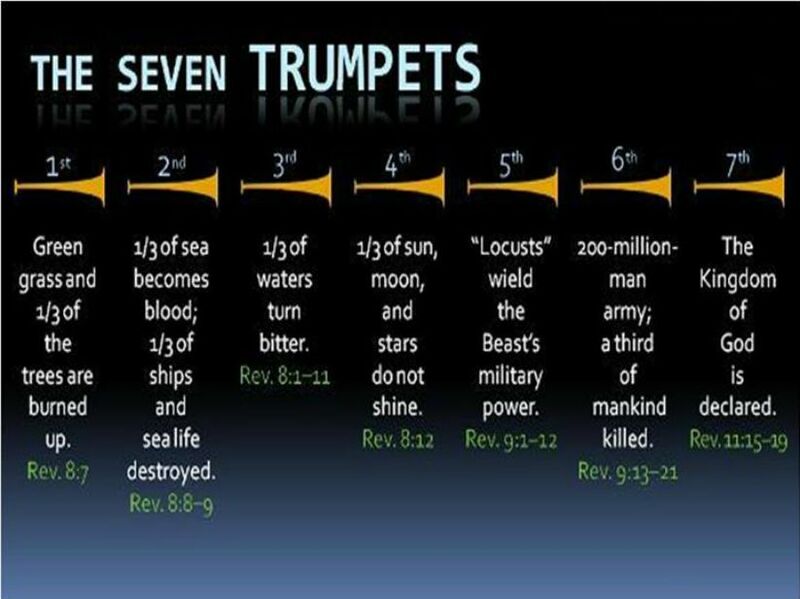 This also is the seventh trumpet sounded by the angel which in turn causes the seven plagues to take place. John sees those who have overcome the beast and his image and his mark. They are playing harps and singing the song of Moshe (Moses). John saw the Temple of the Tabernacle in Heaven open up. The seven angels came out of the temple and they had the seven plagues with them. 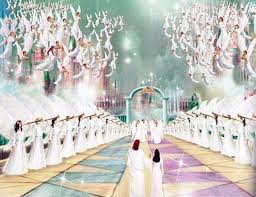 The angels were all in white with golden girdles. 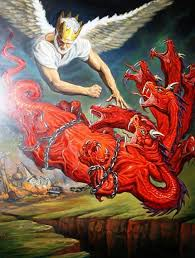 One of the four beasts gave the seven angels seven golden vials full of the Wrath of God. The temple was filled with smoke from God’s Glory. No man was allowed to enter the temple until all seven plagues of the seven angels would be fulfilled. A great voice was heard coming from the temple saying to the seven angels to pour out their vials of the Wrath of God upon the Earth. The first angel poured out his vial upon the Earth and noisome and grievous sores appeared on men who had taken the Mark of the Beast and worshipped his image. The second angel poured out his vial upon the sea and every living soul died in the sea. The third angel poured out his vial upon the rivers and waterfalls and they became as blood. The fourth angel poured out his vial upon the sun and power was given to this angel to search men with fire. The men scorched with fire blasphemed God and they refused to repent despite the unbelievable torment and pain they were in. The fifth angel poured out his vial upon the seat of the Beast (Antichrist) and the kingdom became totally dark for an unspecified time. The blasphemy and hatred of God continued as they blasphemed God with their lips, cursing and blaming God and still they repented not. The sixth angel poured out his vial upon the great river Euphrates and the water dried up completely, so that the “kings of the East” now had a pathway. 3 unclean demon spirits that looked literally like demonic frogs came out of the mouth of the dragon Satan and out of the mouth of the Beast (the Antichrist) and out of the False Prophet. These are the spirits of devils and they in turn possessed the kings of the Earth to make them want to unite in battle against God Almighty in the Battle of Megiddo, in a place called Armageddon. What followed next were voices, thunder, lightning and a great earthquake. This was no ordinary earthquake, this was the most damaging and dangerous earthquake ever in the history of mankind. massive tidal waves like never experienced before utterly destroying all land masses. If that was not enough, huge monstrous pieces of hail came down from Heaven. This hail was so enormous each piece weighed close to 75 pounds (which is the average weight of a Hebrew talent). These gigantic hail stones were more like boulders and they easily could kill a person. Many continued to blaspheme God because of this hail storm of epic proportions. 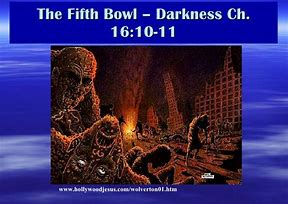 We will next take a look at Chapters 17-19, Mystery Babylon and the actual fall of Babylon. We left off with a hail storm of colossal proportions that we have never seen on the Earth before. Now we pick up where we left off as one of the seven angels carrying the seven vials approaches John the Revelator and tells him that he will show him the judgement to come of the great whore of Babylon that sits upon many waters (which represents the people and the many places including cities and countries). This angel tells John that the whore of Babylon has committed fornication with the inhabitants of Earth and they have become drunk with her evil spiritual fornication. The angel then carries John away “in the spirit” into the wilderness. 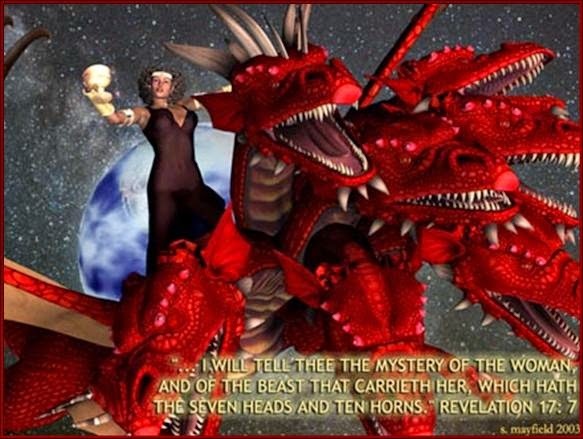 This is where John sees a woman sitting on a scarlet colored beast that was full of names of blasphemy having seven heads and ten horns. We have mentioned this in a previous MOB that the heads and horns represent the rulers of kingdoms and countries that play a role in the New World Order and the Beast (Antichrist System). Mystery Babylon is the religion of the New World Order and the Global Elitists including the Illuminati. 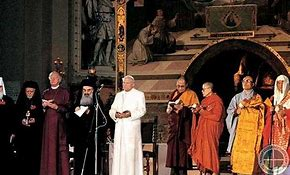 We see the ecumenical World Religion forming before us, this very day. The woman had a golden cup in her hand and it was full of the abomination of filthiness of her fornication. We have been talking about the Mark of the Beast and also God’s Mark on the foreheads of the 144,000 young virgin men from Israel. Now we see another spiritual mark on the forehead of this woman. It was a name written, Mystery Babylon the Great, the Mother of Harlots and Abominations of the Earth. This woman was drunk from all of the blood of the martyred saints who died during the Great Tribulation. Warning the following pictures are extremely graphic and will be found to be quite disturbing to many. We only include them to emphasize the dear price some have paid and will have to pay to be martyrs for Christ during the Time of Jacob’s trouble (The Great Tribulation). Who and what does this evil woman represent? Who would spiritually fornicate with the World, perverting them and also enjoy killing the Saints of God, to the point that they have become drunk with wickedness? Who would gain from doing this? Well obviously Satan (the dragon) is behind the big picture, we can all agree upon that. The woman certainly represents the New World Order’s One World Religion (Mystery Babylon) that is ecumenical to the extreme and accepts all manner of agnostic belief systems, all manner of paganism and idolatry as well as blaspheme that God truly despises. This mother of harlots has committed the abomination of spiritual idolatry and spiritual fornication all over the Earth enforcing all to worship the Beast (the Antichrist) and the dragon (Satan). The angel tells John the answers to the mystery of the woman and the beast that she rides on which has seven heads and ten horns. 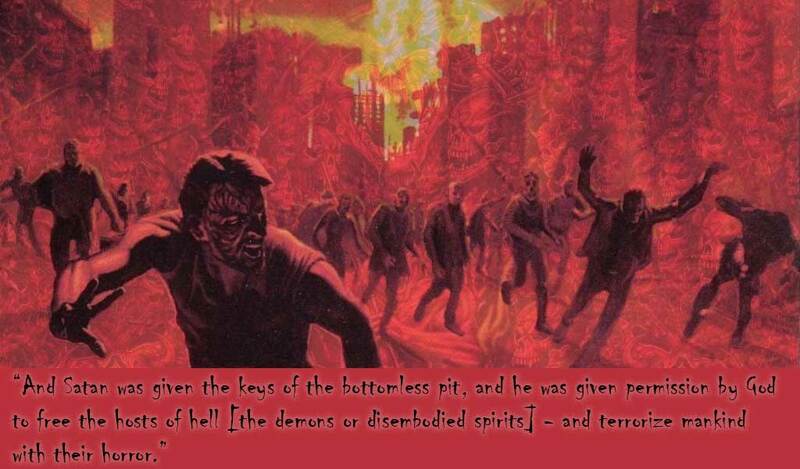 The angel explains that the beast came out of the bottomless pit and it’s final destruction in Hell. Those that are not in the Book of life (the Lamb’s Book of Remembrance) which amazingly enough, was established ever since the foundation of the Earth’s creation. the resurrection of the beast being brought back to life is of course a false counterfeit copy of what Christ did when he died and rose on the third day. So the beast returns miraculously (not from God’s handiwork but from the occultist dark powers of Satan himself) and is alive again. The World Wonders after the beast as he shows up alive once more! The seven heads are seven mountains that the woman sits on. These are seven heads which 5 have been put away and destroyed in the past. One empire, the 6th one has returned and the other one , the 8th one is soon to come. The beast that was, and is not, and then is once more will be the one that will be going to hell eventually. 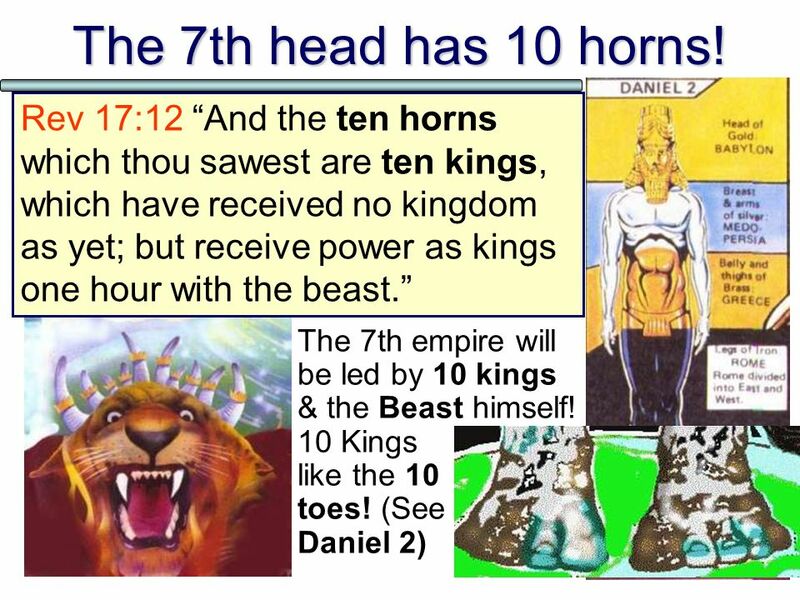 The ten horns are ten kings with Kingdoms and the beast will give them all power for a short time. They will all form an army against God headed up by the Antichrist. 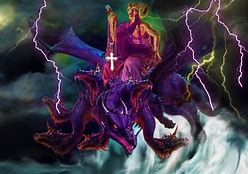 The Lamb, the Lord of Lords, the King of Kings, Yeshua will overcome all the armies of the World and of Satan, the dragon. The angel explains to John the Revelator that the whorish woman sits on the visitors which is all the people and nations. The ten horns which are the ten leaders of the World shall turn on those who perpetrate the One World religion and the One World Order. They will destroy everything to do with the filthy whore. and cried that Babylon the great is fallen and all the demons have taken hold of it, as well as every foul spirit. All the nations have become drunk with the wine of the wrath of her fornications. Another voice from Heaven said, Come out of her, my people that ye be not partakers of her sins, and that ye receive not of her plagues. The sins of the whore of Mystery Babylon have reached Heaven. God has not forgotten any of the sins she has committed. The plagues that will result of God’s Wrath, will be plagues of death and famine. God promises the Mystery Babylon religion will be completely and utterly destroyed and burned with fire. All the kings of the Earth that were actively involved in this Mystery Babylon religion lamented for her saying, Alas that great city Babylon, that mighty city! For in one hour is thy judgment came. All the merchants of the Earth mourn for the city of Babylon for no one is buying anything anymore. A mighty angel, most likely an arch angel (when it says mighty) took up a big millstone and cast it into the sea. 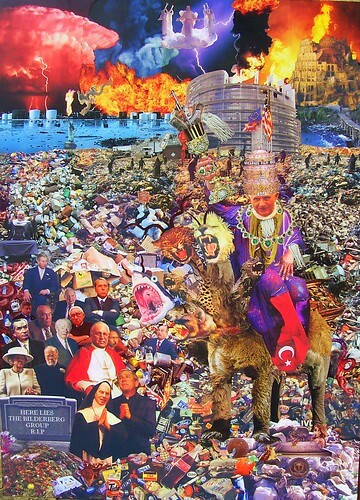 This represents the end of Mystery Babylon, the city and the religion has reached it’s end. We will continue with Ch.19, on the next MOB in this series. We continue with Ch.19 of the Book of Revelation. 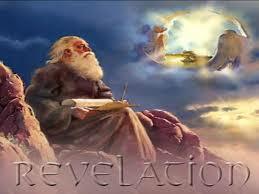 John the Revelator heard a great voice of many people coming from Heaven. They were praising the Lord for how he dealt with the great whore of Babylon who had corrupted the Earth with her fornication. 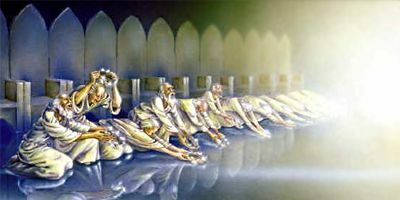 The 24 elders and the four beasts fell down and worshipped God almighty. The voice came from the Throne of God telling all his servants to praise him. A great multitude of voices then continued to praise the Lord God for the marriage of the Lamb was going to happen soon. 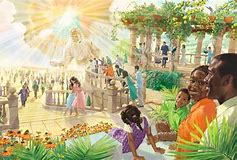 What a time that will be when all believers now translated and even the spirits and souls of Old Testament Saints gather to honor their marriage to Yeshua who has come for His Bride, the True Body of Christ (the Church) dressed in white robes of righteousness. The Supper Ceremony and Wedding Banquet can’t last forever because there is still much work to be accomplished in the Father God’s Plans. 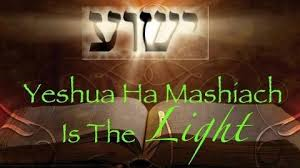 John was told by another fellow servant in Heaven that the testimony of Yeshua is the Spirit of Prophecy. 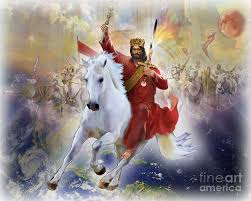 At this time finally, the 2nd coming of the Lord Jesus Christ is at hand as Heaven opened up and a white horse appears with a rider sitting on it. This is the Righteous Judge, the one who is known as faithful and true, the one who judges in righteousness and makes war with the wicked to right the wrongs and injustices on the Earth. Yeshua is described as having eyes like flames of fire. His head had many crowns and he now has a name that no one has known to this time except of course, himself. Yeshua is clothed in a garment that has been dipped in blood (a reminder of the supreme sacrifice he made at Calvary) and his name is called the Word of God. 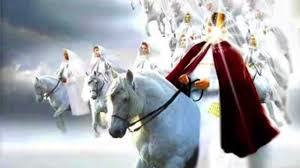 The armies of Heaven followed the Lord also on white horses. They too wore clothes in fine linen so white and clean (from the blood of the Lamb who taketh away the sins of The World). Out of the Lord’s Mouth came the word of God like a sharp sword or as we say the God Breathed Spirit’s Sword used to smite the wicked rebellious nations who chose of their own fruition to war against God. However it is the Lord who will rule these nations with his rod of iron and tread their winepresses with his ferocious wrath. On the thigh of his garment is written King of Kings and Lord of Lords. 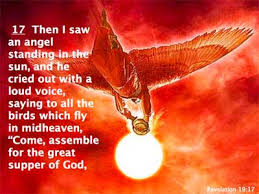 Then John the Revelator sees an angel standing in the sun crying with a loud voice, saying to every living bird and fowl of the air and on the face of the Earth to all gather together for the Supper of the Great God. 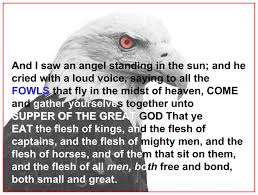 The fowls will dine on all the kings and captains of the armies and soldiers who sought to fight against God of their own fruition and now will be in turn, eaten and consumed of all flesh by the fowls of the air. 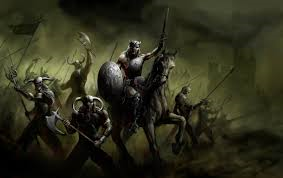 The beast and his army were gathered together to make war against Christ and his angelic host. 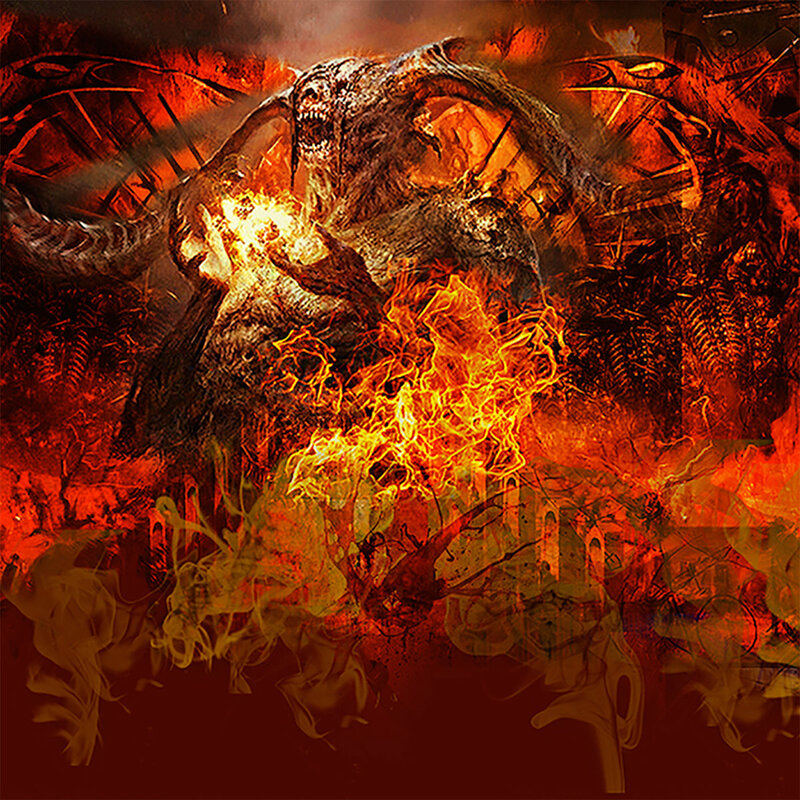 Just like that, the war was over before it really got started and the beast and the false prophet and all those who blindly followed them and worshipped them and received the Mark of the Beast were all cast alive into a lake of fire and brimstone. Still a remnant remained and they were slain by the Sword of Yeshua, the one that sat upon the horse. The sword is a spiritual sword that proceeded out of the Lord’s Mouth. All the fowls of the air finished off the flesh of the remainder of the beast’s army. 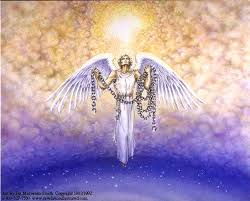 John then saw an angel come down from heaven and this angel had the key to the bottomless pit and also a great chain in his hand. The angel took hold of Satan, the dragon, the old serpent and bound the devil for one thousand years. 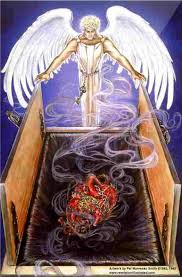 The angel cast Satan into the bottomless pit and shut him up in there with a seal. Now finally Satan could not harm the World anymore, until the thousand years was up and then he would be loosed for one last little bit of time. We will speak about why that has to be coming up. John sees all the thrones and the judgment that was to be rendered to all. John saw all the souls of those that were beheaded for the witness of the Lord Jesus Christ and for the Word of God. These had not worshipped the beast, his mark, his image and so they were beheaded. Now they would live and reign with Christ for a thousand years. This is the Millennial Kingdom of Yeshua’s Glory. All the others who had died previously were not to be resurrected until after the thousand years was over. We know this as the first resurrection of the dead. Blessed are those who will take part in the first resurrection, for the second death (permanent absence from God for eternity in Hell) cannot affect them. 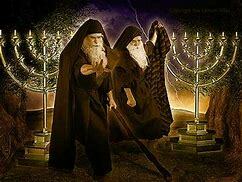 These will be Priests of God and will reign with Yeshua for 1000 years. 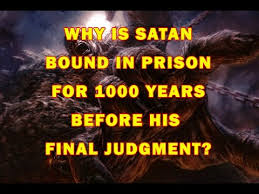 Then and only then will Satan be let loose from his prison in order to run amok upon the Earth for one last attempt to dethrone God. Satan will attempt to do what he does best and that is deceive the nations to do his fighting for him once again. 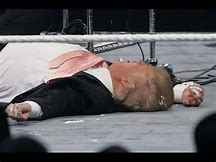 Since he has no beast or false prophet this time around and has to go it alone, he gets Gog and Magog to gather together to form a giant army once again to fight against God. This Satanic army turns it’s eyes on Jerusalem, the beloved city and was planning to invade and destroy all of God’s Saints, when God sent fire from Heaven which devoured all of Satan’s army. to join his demonic cronies, the Antichrist (the beast) and the False Prophet. All of them will be tormented day and night forever and ever. God “used” Satan one last time to rid the Earth of evil and corruption for good. There never would ever be a need for Satan ever again in God’s eternal kingdom, he is finished and done forever. 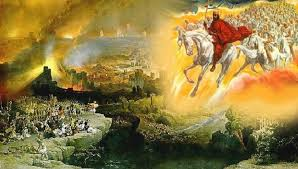 John the Revelator next sees the Great White Throne of Judgment for the final Judgment Day has arrived. The Lord of Lords and King of Kings, Yeshua Ha’Mashiach, the Messiah sat upon the Great White Throne of Judgement. and the books were opened including the most important one of them all, the Book of Life. 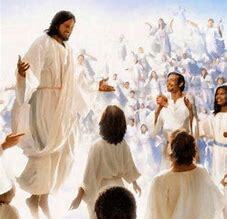 All the dead from both the Earth and the Sea were resurrected and every man now would stand before the Almighty God so that they will be judged according to their works. 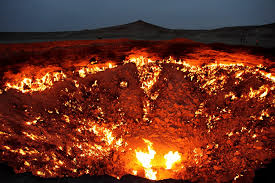 Death and Hell were cast into the Lake of Fire and this then became the second death, for all those not written into the Lamb’s Book of Life were cast into the Lake of Fire. for the former Heaven and Earth were now officially no more in existence. John also notes that all the seas of the Earth are gone, so he may only be seeing land masses at this point. 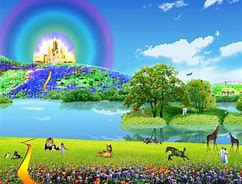 John sees the Holy City, the New Jerusalem in all of it’s splendor come down from God out of Heaven. Finally the days of God’s Wrath are finally over with once and for all. Now with the Judgement Day also past, the time of celebration and worship of God has arrived for all of eternity. John heard a great voice out of Heaven saying that the Tabernacle of God is now with men and they shall dwell with God forever. The great voice promises every tear will be wiped away and all pain removed from one’s life no matter how much they have suffered in their past life mentally and physically, it’s finally over for good. The former things have truly passed away and the tribulation of life has now ceased as all have overcome because the Lamb of God, Yeshua overcame all things first. The Father God who sits upon his throne said that he makes all things new. One of the seven angels who carried the seven vials full of the seven last plagues spoke to John saying, he would show him the Lamb’s Bride, the real Church of God, the true Children of God. So the angel carried John away “in the spirit” to a great and high mountain. 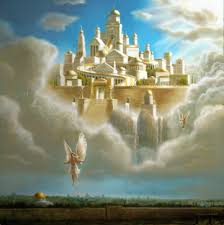 The angel showed John the great city, the holy city of New Jerusalem descending out of Heaven from God. The city had walls with 12 gates and the gates have 12 angels representing the 12 tribes of Israel. The wall of the city had 12 foundations and in them contained the names of the 12 apostles of the Lamb, the Lord Jesus Christ. but more importantly because the Glory of God dwelt there. All those who live in the Holy City are those who have been written into the Lamb’s Book of Life. 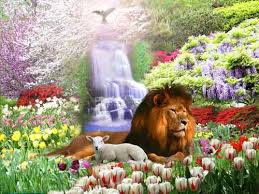 John saw a pure river of water, water of life so clear as crystal proceeding from the throne of God and of the Lamb of God, the Lord Jesus. On either side of the river was the Tree of Life which had 12 different types of fruit which was for the healing of the nations. blessed is he that keepeth the saying of the prophecy of this book. John was so overwhelmed by all that he had seen; he accidentally began to worship the angel. The angel reminded him that he is a fellow servant of the Lord and only God should be worshipped. The angel also told John to not seal up the prophecies of the Book of Revelation for the time is coming when all of mankind will need to know of it, since it is written for the end times which we live in right now. The Lord also wanted John to know that he comes quickly and his reward is with him, to give every man (and woman) according to their works. For the Lord God is Alpha and Omega, the Beginning and the End, the First and the Last. Blessed are those that do the Lord’s Commandments and they in turn get to eat of the Tree of Life just as Adam and Eve had done at one time. 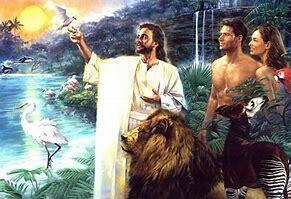 In a way God has restored the Garden of Eden, but with a big difference. There is no serpent in a tree to beguile man this time. Everything comes full circle with God’s Plan as the Mystery of Iniquity is finished; sin is wiped out of everyone’s memory. Not a single tear will ever be shed in Heaven and for good reason. Yeshua reminds John that he has sent his angel to testify to the churches of who he is, the Messiah, the offspring of David and the Bright and Morning Star. John reinforces what God told him by stating that no man should add or take away from the prophecies of this Book, unless they want all the plagues in the book, to be added to them as well. God promises to take one’s name out of the Book of Life if someone takes away any part of the Word of God. Once again the Lord reminds John that he is coming quickly. It’s a warning to all of us, to get ready and be prepared. Jesus is coming soon, so look up, your redemption draws nigh.